Sherry"s Stamped Treasures: Hooray! It's time for Sale-a-Bration! Hooray! It's time for Sale-a-Bration! Today's a big day! So much to share with you. 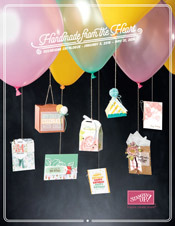 The 2016 Occasions catalogue goes live today! It's chalk full of all sorts of great new products. You can view the catalogue online using the link below. If you are in Canada and would like a hard copy and don't already have a demonstrator, just send me your name and address and I can pop one in the mail for you. Sale-a-Bration (SAB) also goes live today! Every year SAB is a little different so here are some things to note for this year. - On Feb. 16th, a few new items will be released. - The items on pages 4-15 are available throughout the SAB sales period (Jan. 5 to Mar. 31). - As a HOST your qualifying party will earn you an extra $35 in Stampin' Rewards and you can even apply your rewards toward your starter kit! Contact me today to book your party or private class! 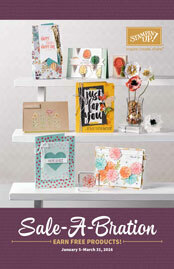 - If you decide to JOIN Stampin' Up! during SAB, your starter kit is only $125 (no GST or shipping) and you can choose $195 in product. That's $40 more in products for free! If you know you'd like to join SU, click here to sign up! What could possibly make Sale-A-Bration even better? Getting Paper Pumpkin involved of course! During SAB, our 3-month and 12-month prepaid subscriptions are on sale AND you can qualify for SAB items!